I was brought up by the sea. I’m a comical swimmer and a bemused sailor, but give me a shoreline to walk along and I’m content. It’s the best of both worlds – feet on solid ground and eyes on the waves. 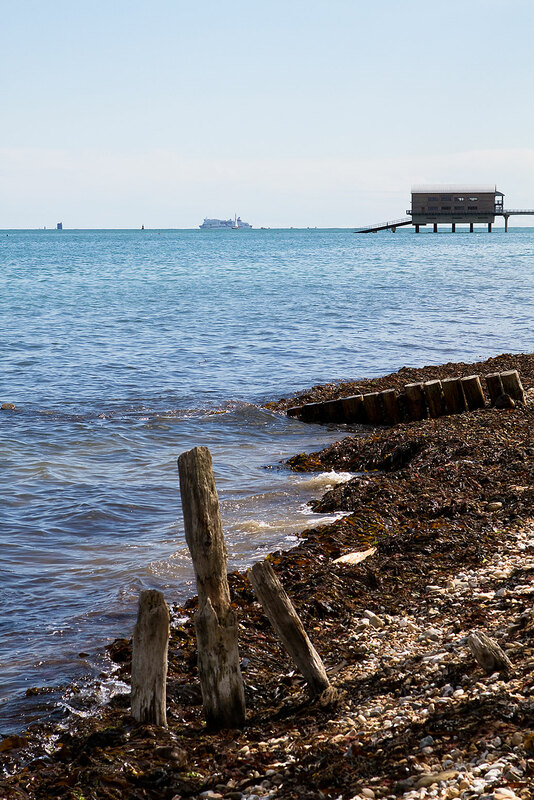 Foraging for wild ingredients turns a coastal walk into a glorious expedition. Depending on the season there’ll be handfuls of plumply purple blackberries, some salty samphire and, if you’re lucky, wild garlic leaves and flowers. Take your children, ask a friend, and between you, you’ll bring home a feast. This weekend a great friend and I took a walk along a wooded coastal path and gathered enough garlic leaves and wild sea spinach to make soup and frittata, with more left over for risotto, garlic flower tempura and garlic leaf pesto. Wild garlic flourishes in the shady woodland that hugs our wilder coastline. Unlike wild mushrooms which have a sinister way of pretending to be friendly when they’re psychotic murderers, wild garlic leaves are cheerily, perkily, reliably delicious. The plant may resemble poisonous lily of the valley, but you need only bury your nose in it to be enveloped in clouds of reassuringly pungent garlicky fragrance. 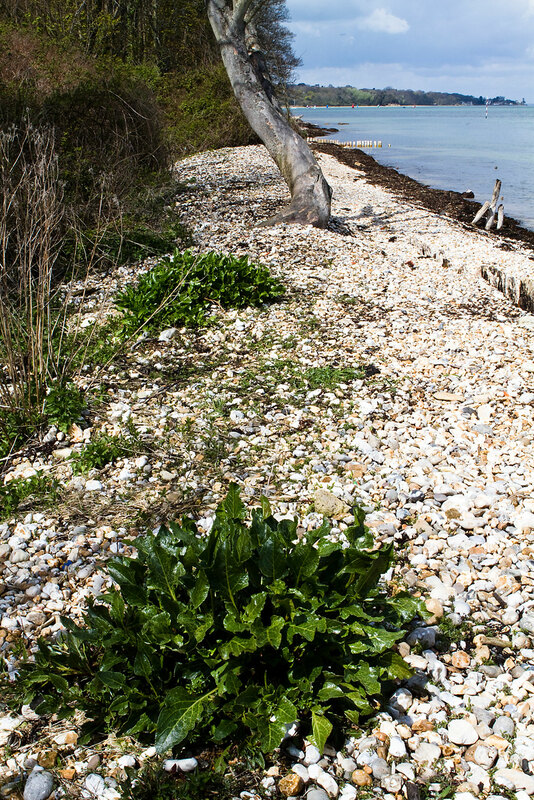 Sea beet is another reliable friend that bursts in florid clumps from the most inhospitable-looking pebbly beaches. It resembles wild green facial hair erupting from a stubbly chin and tastes very like spinach, but it has more sweetness and less sulky muddiness. 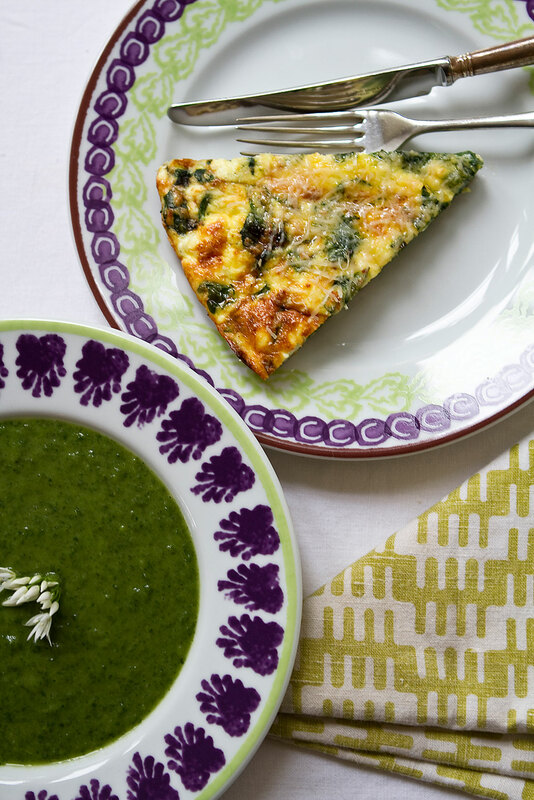 Sea beet and garlic leaves combine to make the most delicious and nourishing frittata, while a combination of wild garlic and watercress makes the kind of soup that would fortify the weariest traveller. Sweat the onion in the olive oil until it’s soft, but not brown. Add the potato, season and stir briefly before adding the stock. Cook for around fifteen minutes until the potato is soft. Add the garlic leaves and watercress and simmer for no more than five minutes. You want to preserve the startling green colour without trespassing into the khaki zone. Tip the soup into a food processor and whizz until smooth. Check the seasoning and serve with garlic flowers which are delicious in flavour. Blanch the garlic and sea beet leaves in boiling water for a generous minute until wilted and bright green. Plunge the leaves into cold water to stop cooking. Once cold, wring them out as though you were drying a towel and slice coarsely. Using a large, non-stick frying pan that you can put in the oven later, saute the onions in 2 tablespoons of the olive oil. Once they’re soft and starting to turn golden add the mushrooms. Saute until the mushrooms are brown and soft. Take the pan off the heat. Beat the eggs with a fork, add 50g of the parmesan and all of the ricotta and mix well. Season. Drape the blanched, chopped leaves over the mushrooms and onions in the pan. Pour the egg and cheese mixture over the top, making sure that the leaves are submerged. Place the frying pan in the oven for 15 minutes until the top of the frittata is nicely brown. Allow to cool a little and then tip the frittata out onto a plate. Grate the remaining 50g of parmesan over the top and the remaining 2 tablespoons of olive oil. Serve with a green salad and some new potatoes. 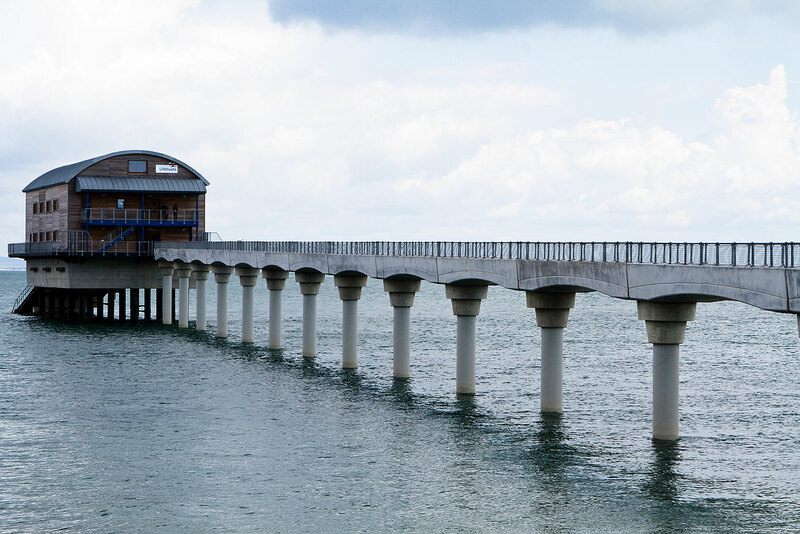 I love everything about the seaside – from the wild shorelines of Orkney to the brash oddities of Bournemouth. Just don’t ask me to swim in it, sail on it or surf through it. I will though, at a pinch, paddle in it. I really think this is your best post yet Charlie. The colours of the green garlic and the sea beat and the turquoise of the sea blend so well. Fantastic, truly. What praise. Thank you very much, Boinsey – I’m touched. I hope you get a chance to try wild garlic. Being both delicious and free, it seems like magic. I love the sea, one of the joys of living in Angus is that we have sea and glens,foraging is deliciously varied. My husband has just taken over the SUMP (makes me smile too – South Uist Medical Practice) where I found sea kale…so exciting. We have wild garlic in the woods behind the Angus house; I’m told it was planted in driveways of Scottish country houses, easy access without the ‘stinkiness’ ? Who knows. I love the idea of foraging it by the sea. A lovely blog and your photographs are fabulous. Hi Fi and thank you for taking the time to leave a comment. Your message coincided with the discovery from Charlie Hicks on Twitter that sea kale is now being grown and sold commercially. Until now it’s been almost impossible to find. No wonder you were excited to find it in Angus. I didn’t know about Scottish houses and their impromptu driveway garlic patches – how intriguing. I recognise your lovely walk! You were a stones throw or two from my home. I was on the mainland this weekend though or I would probably have bumped into you, as that is one of our favourite walks. Love the smell of the wild garlic as we pass by. I still need to make the crumpets, but haven’t got the special rings to cook them in yet. What an extraordinary coincidence, Chris. I was staying with great friends on the island. I got there late at night and when I opened the blind the following morning my jaw clanged onto the floor at the beauty of the views. Instructive (I now know what sea beet is) and beautiful. I’m longing for a pebble beach with driftwood now (instead of the hot, white sand but ultimately fairly boring beach I live near). 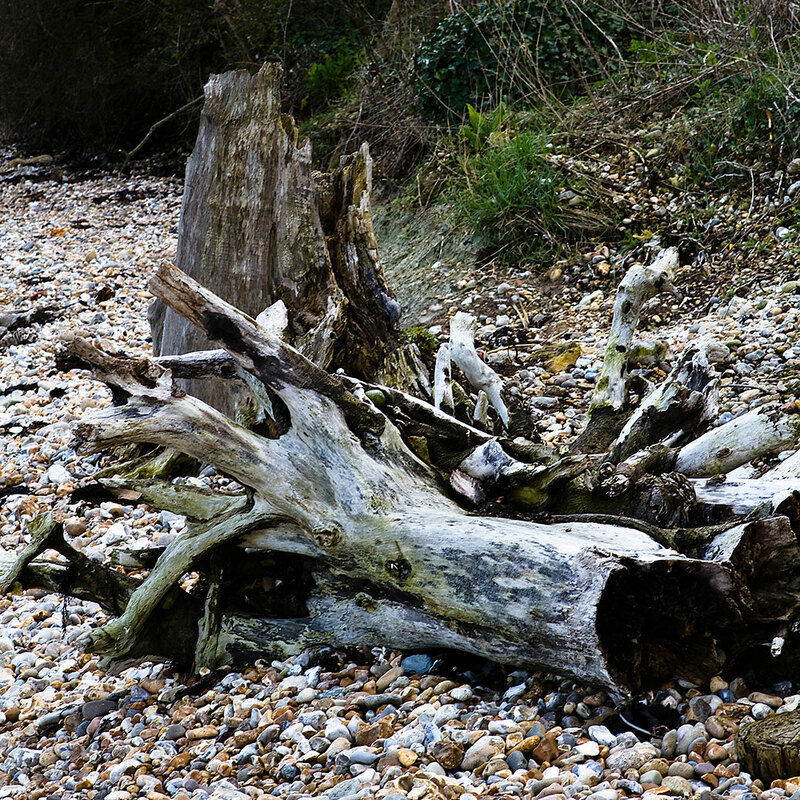 The driftwood on that beach is beautiful, although hot, white sand sounds very appealing too, Sally. Lovely post. Am all for foraging too. 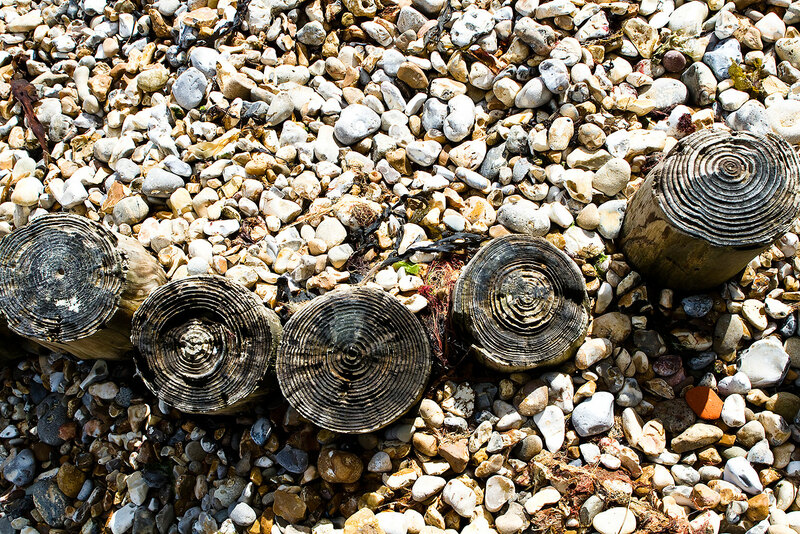 Foraging is a fundamental delight – I couldn’t have enjoyed my day on the beach more. Another cracker. Great photos – very evocative of place and the macros have lovely colour. Recipes, as always, slightly unusual and look delicious. Text ditto, if text can be delicious. Triple whammy of the successful kind. I love the idea of delicious text – thanks Jakey. If you have any wild garlic growing near you I recommend it highly. Sea beet – never heard of it! But as a huge fan of foraging (well, as far as this is possible in Zone 3 in London!) I would love to find some to try. 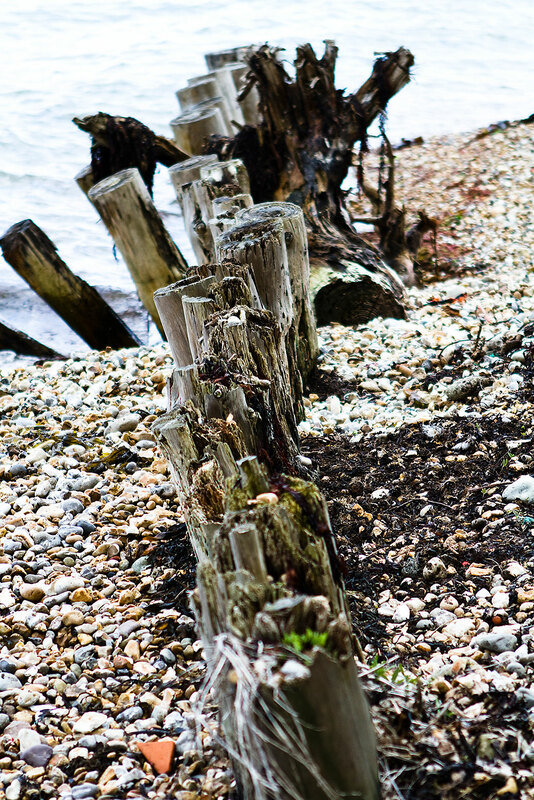 Love the seaside snaps, especially the one of the tops of the wooden posts among the pebbles – just gorgeous! I don’t think ‘sea beet’ is a very good term for it really. ‘Wild spinach’ is much more accurate a description, both of its taste and of the way it wilts when cooked. But ‘sea beet’ it is. And it’s very plentiful, unlike elusive sea kale. Beautiful photos, whimsical writing that made me smile. And fascinating! Who knew? Now when we next go to Brittany I must ask my expert husband and friends if we can forage! I grew up next to the ocean but have never really been a friend. But our beach wasn’t as wild and romantically pretty – our was scorching white sand, scuttling sandpipers, the occasional stinging jellyfish and too many surfers. But lull me home for that amazing frittata! I do long the sound of your childhood beach, Jamie. Not sure about the scuttling sandpipers though or the jellyfish for that matter. But I bet you didn’t have to wear wellies, gloves and a woolly hat like I did. It was such a satisfying day and the spoils were delicious. I’d love to know if you find the same treasures in Brittany. 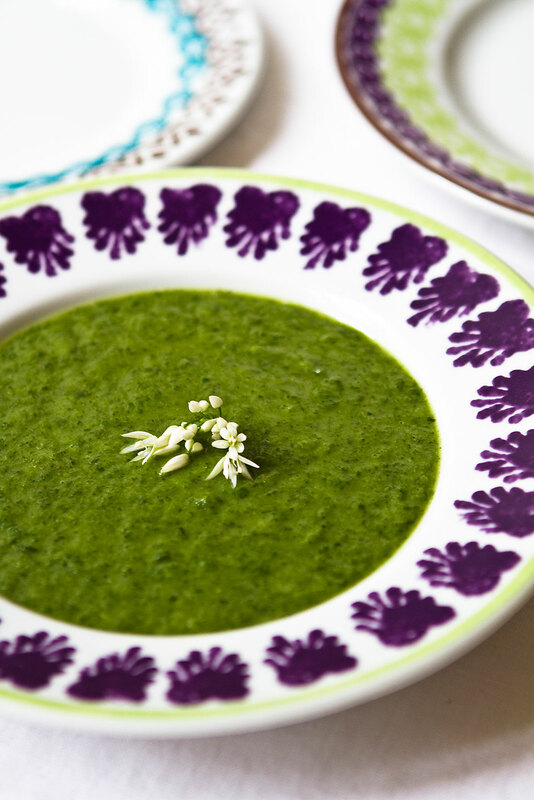 Finding wild garlic while taking your children to school sounds wonderful, Urvashi. I hope your girls enjoy it too. My children loved both the frittata and the soup. Lovely photos and fascinating post. 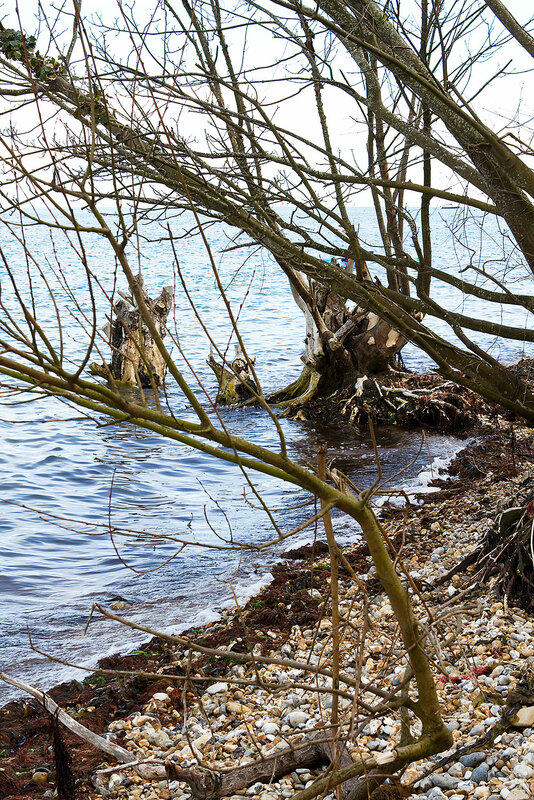 We live by the shore yet have never foraged there. At the most we’ve picked up sharks teeth and scallop shells. It is time for us to “go green” and see what edibles we can find near us. I love the idea of taking my girls foraging. Thank you for suggesting a marvelous weekend family trip. How fascinating to live by an ocean that turns up sharks’ teeth and scallop shells. That sounds so exotic by comparison and just as interesting. I wonder what edible plants you will find. I’d love to know what you discover. What a lovely post: words and photos and flavours of everything in abundance. All of it so intoxicating. Especially love the shot of the wooden posts in the pebbles and the food looks so good. Thank you, Matt. It was a magical day – a grown up version of those days at the seaside as a child, when you bring home seashells, pebbles and seaweed for your bedroom. Beautiful images, and the colour of that soup is wonderful. I love a bit of foraging too, but often worry too much. Have been doing a bit of foraging in my garden, but need to head to the coast as you have inspired me to do. I’m so happy to have inspired you, Marcus. I completely agree with you about the appeal of foraging. Let me know what you find. I love foraging for wild garlic, rocket leaves and co. I have to however admit I was unaware that wild garlic also grew on coastlines I was really under the impression they grew in woods/forests. I am now intrigued to know if they taste different to those I forage here. 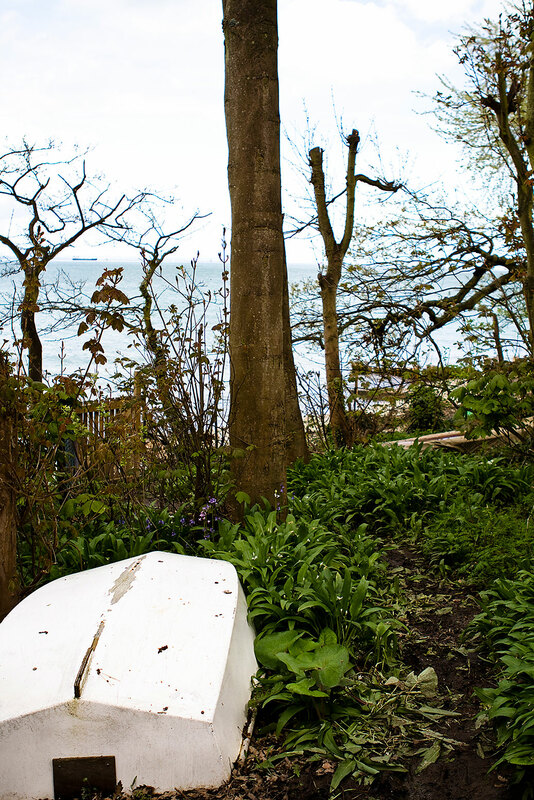 I’ve often seen wild garlic by the sea, usually amongst the trees on our wilder coastlines. But this year I saw it growing in the park in the centre of Oxford! I wonder if it would work in a domestic garden, although half the fun of it is the foraging. Hello! I just saw this post. 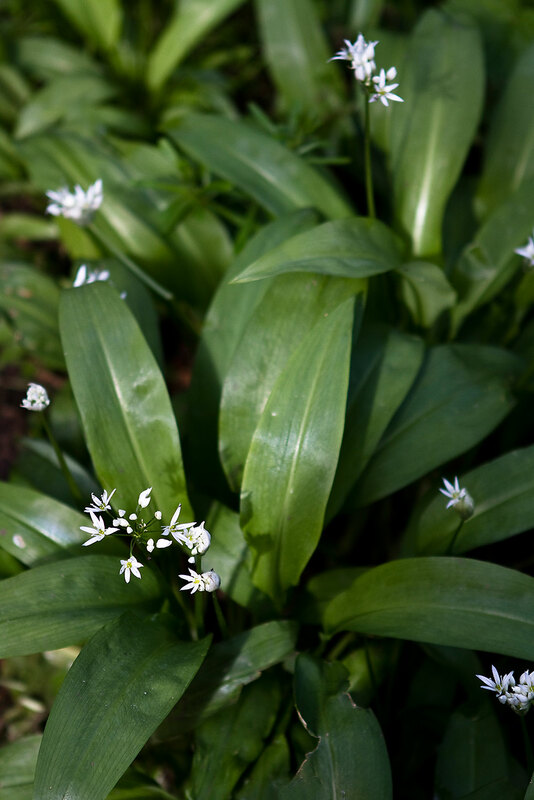 I am currently living in the Oxford area and am looking for places to go foraging for wild garlic, could you please tell me of any places within the Oxfordshire are you have found it? much appreciated. Funnily enough I saw some in Oxford’s University Parks last year, although I doubt they would welcome anyone taking a bunch! I’ve always done my collecting in Dorset, so I can’t really advise on Oxfordshire I’m afraid.